Sixty-six million years ago, the world burned. An asteroid crashed to Earth with a force one million times larger than the largest atomic bomb, causing the extinction of the dinosaurs. But dinosaurs weren't the only ones that got hit hard--in a new study, scientists learned that the planet's forests were decimated, leading to the extinction of tree-dwelling birds. "Looking at the fossil record, at plants and birds, there are multiple lines of evidence suggesting that the forest canopies collapsed," says Regan Dunn, a paleontologist at the Field Museum in Chicago and a co-author on the study in Current Biology. "Perching birds went extinct because there were no more perches." "We drew on a variety of approaches to stitch this story together," said Daniel Field, the paper's lead author, of the Milner Centre for Evolution at the University of Bath. 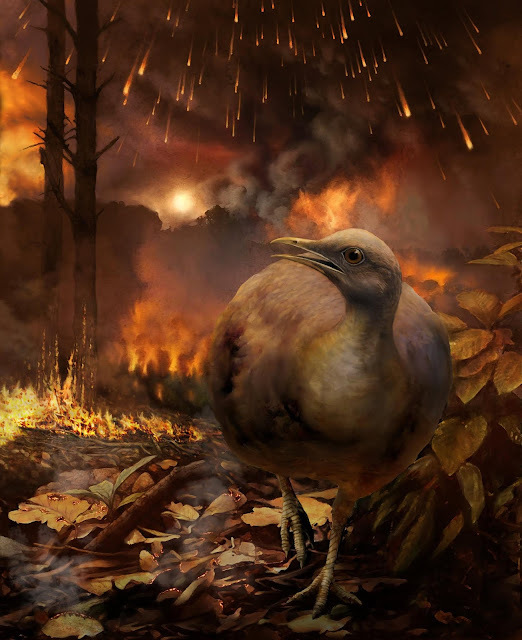 "We concluded that the temporary elimination of forests in the aftermath of the asteroid impact explains why arboreal birds failed to survive across this extinction event. The ancestors of modern arboreal birds did not move into the trees until forests had recovered from the extinction-causing asteroid." 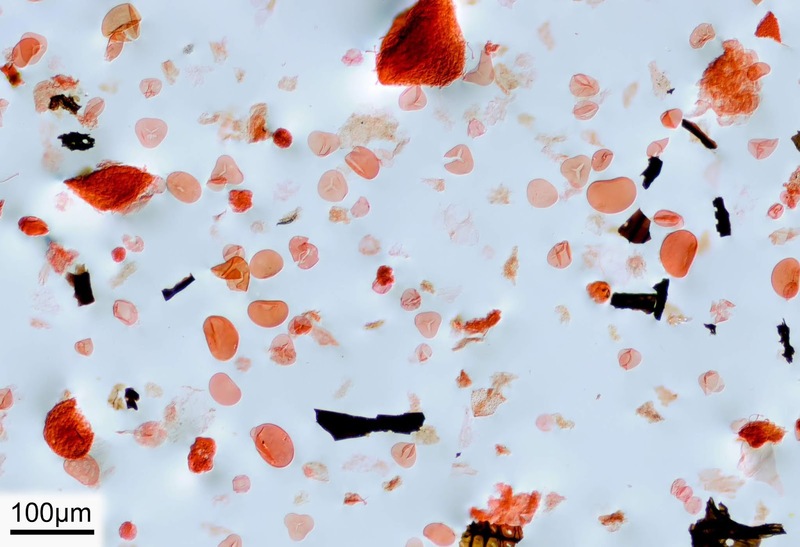 The project's pollen expert, Antoine Bercovici of the Smithsonian Institution and the Denver Museum of Nature and Science, helped determine that the world's forests were destroyed by looking at microscopic fossils of pollen and spores. Dunn explains, "After a disaster like a forest fire or a volcanic eruption, the first plants to come back are the fastest colonizers --especially ferns." That's because ferns don't sprout from seeds, but from spores, which are much smaller--just a single cell. "Spores are minuscule, the size of a grain of pollen, so they're easily dispersed. They get picked up by the wind and go further than seeds can, and all they need to grow is a wet spot." "The spores are tiny--you could fit four across a single strand of your hair," says Dunn. "To see them, we take a sample of rock from the time frame just after the collision and dissolve it in acid. Then we purify it so that all that remains is the organic debris, like pollen, spores and little leaf bits, then we look at them under a microscope." Immediately after the asteroid hit, the fossil record shows the charcoal remains of burnt trees, and then, tons of fern spores. An abundance of fern spores in the fossil record often comes on the heels of a natural disaster that destroyed larger plants like trees. 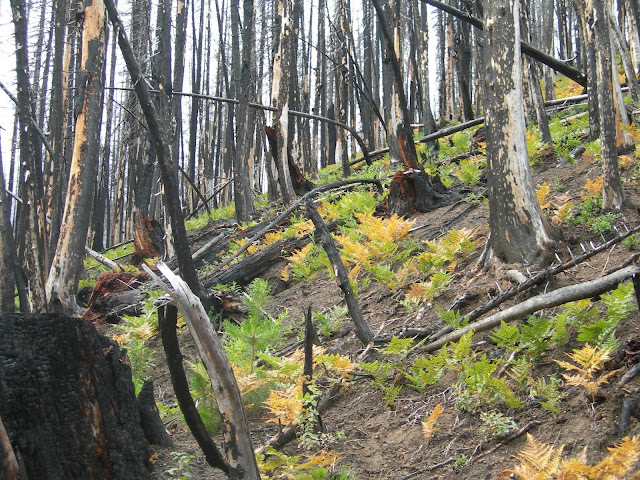 "Our study examined the fossil record from New Zealand, Japan, Europe and North America, which showed there was a mass deforestation across the globe at the end of the Cretaceous period," says co-author Bercovici. And with no more trees, the scientists found, tree-dwelling birds went extinct. The birds that did survive were ground-dwellers--birds whose fossilized remains show longer, sturdier legs like we see in modern ground birds like kiwis and emus. The Cretaceous equivalent of robins and sparrows, with delicate little legs made for perching on tree branches, had no place to live. "Today, birds are the most diverse and globally widespread group of terrestrial vertebrate animals--there are nearly 11,000 living species," says Field. "Only a handful of ancestral bird lineages succeeded in surviving the mass extinction event 66 million years ago, and all of today's amazing living bird diversity can be traced to these ancient survivors." And while fossil animals like dinosaurs and birds often get more love than fossil plants, Dunn says that plants are critical to understanding life on earth. "Plants are everything, plants are the context in which all terrestrial life evolves and survives. They're primary producers, they make energy available to all life forms by capturing it from the sun--we can't do that." She also notes that while the dinosaurs and their perching bird neighbors died 66 million years ago, their plight is relevant today. "The end-Cretaceous event is the fifth mass extinction--we're in the sixth," says Dunn. "It's important for us to understand what happens when you destroy an ecosystem, like with deforestation and climate change--so we can know how our actions will affect what comes after us."